The Rev. 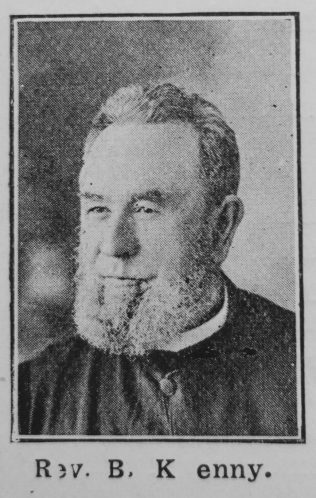 B. Kenny, died at Granville, New S. Wales, on Tuesday morning, May 20th, 1902, after labouring in this State as a P.M. Minister for 38 years. Mr. Kenny was a native of Ireland, and resided with his parents at Portadown, till he was near 20 years of age, the family belonged to the Roman Catholic Church. He remained in the Church of his father till he was near 20 years of age, when he went to England, and for a time resided at Louth. He there formed an acquaintance with a young man who was a zealous Primitive Methodist, and his new friend invited him to the P.M. Church. A good work at that time was going on under the labours of the Rev. Parkinson Milson. Mr. Milson was the preacher on the Sabbath evening Mr. Kenny attended, it was the first Methodist service our friend had ever attended. The service was so plain and homely, that it contrasted strongly with the pomp and show of the Church to which he had been accustomed. But in that first Protestant service he was convinced of his state as a sinner. He was broken down into a state of penitence, and commenced to pray for pardon. Eventually, he believed in Christ as the only and all-sufficient Saviour. He at once joined the Church, and continued a loyal Primitive Metliodist, until Australian Methodist Union took place. After due preparation he entered the Ministry, and laboured on the Portadown and Glasgow stations with great success. In the year 1864, ministers being wanted in this State, he was asked by the Rev. Moses Lupton, to come to our assistance; he complied with the request, and with his wife reached Sydney, July 7th, 1864. His first station was Parramatta. He received a public welcome to his new station on August 8th, 1864. He entered very earnestly into his work; he preached in the open air as well as in the church. Every Sunday afternoon and almost every Sabbath evening witnessed conversions. Some of those who were led to God by his ministry, have long since joined the Church Triumphant, some are still with us. Bernard was born on 26 June 1833 at Portadown, Ireland. Bernard married Mary Lundle on 1 March 1864 at Hutchesontown, Glasgow, Lanarkshire. 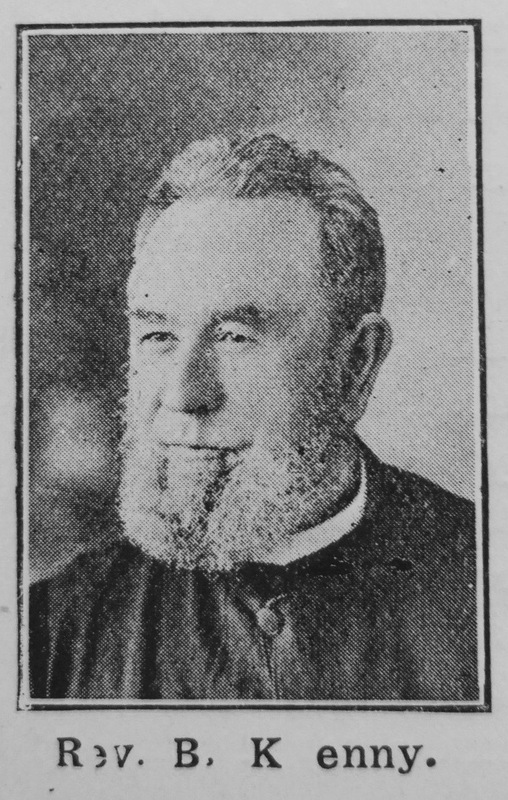 He was President of the Australian Primitive Methodist Conference in 1885. Bernard died on 20 May 1902 at Granville, New South Wales, Australia.